We feature many Android-based modding tutorials here at Redmond Pie, helping you get your custom ROMs, launchers and other bits and pieces installed onto your device as smoothly and efficiently as possible. Today, we’ve stumbled across a pretty nifty little app which will assist you greatly next time you decide to flash or install a custom ROM. Version 2.0 of GooManager has just been released to the Google Play Store. Labeled as a front-end app for the popular free Android file hosting site, Goo.im (previously known rather tastefully as Goo-Inside.me), it’s a useful tool in helping you get all those Google applications once you’ve flashed your custom ROMs. Simply put, the app helps you source .zip files suitable to your device, which you, in turn, flash in recovery for up-to-date Google Apps. 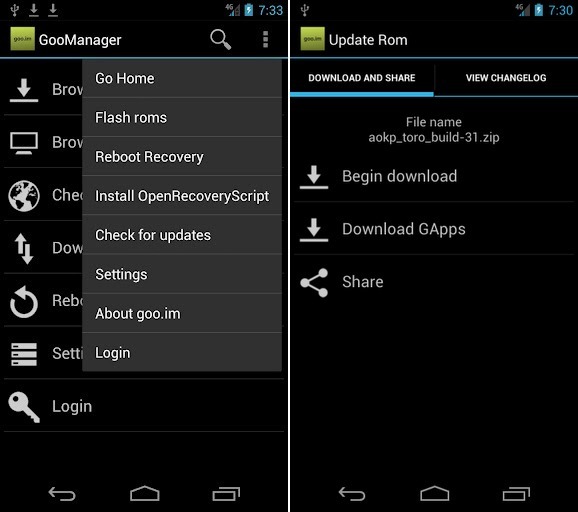 Updated with a plethora of new features as well as improvements and bug fixes, GooManager now allows you to install ROMs using a new 100% open source recovery API called OpenRecoveryScript. It currently supports an impressive 17 different devices in total, and you can check to see if your device is compatible by checking it against the full list here. If your device is not on the checklist, the developer does note that new devices are frequently being added, so keep checking back for more information. GooManager has been built with the help of Teamwin, whose member Dees_Troy is behind the impressive OpenRecoveryScript engine. The creators of GooManager have no qualms with third parties building APIs to run recovery commands such as flashing zips, creating backups, and wiping data, so if you’re in this particular field, GooManager will undoubtedly be of interest to you. It’s still in beta, so is rough around the edges, although with an average of 4.7/5 from the early adopters over at the Google Play Store, it’s certainly worth trying out. The developers, however, only recommend downloading if you would consider yourself a seasoned Android modifier, stressing that those failing to understand what the app does shouldn’t download or install it. Additionally, please note that it’s for rooted devices only, and will have no effect whatsoever on an untouched stock device.